A better mousetrap The VetMouseTrap, a restraint device developed by veterinary radiologist Robert T. O'Brien, is enabling clinicians to conduct CT scans on patients that couldn't be scanned previously, leading to faster diagnosis and treatment of life-threatening conditions. CHAMPAIGN, Ill. - Advancements in the use of computed tomography (also known as CT) imaging by researchers at the University of Illinois Veterinary Teaching Hospital are enabling them to diagnose life-threatening conditions in dogs and cats faster, dramatically affecting the course, outcomes and costs of treatment. Robert O'Brien, a professor and head of diagnostic imaging in the department of clinical medicine at the College of Veterinary Medicine Teaching Hospital, discusses the use of the VetMouseTrap. With faster diagnoses, aggressive, appropriate treatment can begin within minutes - rather than hours or days - of patients' arrival at the hospital, so they recover faster and return home sooner, reducing hospitalization costs for their owners, said Robert T. O'Brien, who is a professor and head of diagnostic imaging in the department of clinical medicine at the hospital. "Speed is really quite important in all medical environments, but especially, in my opinion, in veterinary medicine," O'Brien said. "The patient is suffering because we don't know what's going on, so we can't treat it, and the animal can be getting worse instead of better because we don't know the right therapy. To get an answer right now allows us to be very aggressive and purposeful in our therapy." 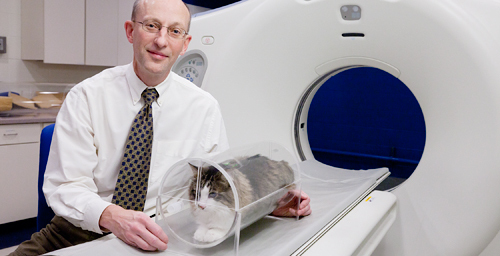 A restraint device that O'Brien invented called the VetMouseTrap™ is allowing clinicians to broaden their use of CT scans with small animals. A transparent Plexiglas tube with foam padding inside, the device immobilizes cats and other small animals in a neutral sternal position so they can undergo CT scans without general anesthesia. Cats and dogs with abdominal or airway obstructions often couldn't be scanned previously because of the risks posed by general anesthesia or because the breathing tubes used during anesthesia interfered with viewing the larynx and associated disease. "X-rays are extremely poor at detecting disease of the larynx," O'Brien said. "And laryngeal disease has never been imaged with CT before - ever - because of the need for general anesthesia. We never could look at how the larynx was functioning when there was a breathing tube in the larynx - but we can see laryngeal disease now very nicely on awake cats. Our latest research tells us that not only can we detect lung disease now, we can tell whether they have congestive heart failure. And that's just been a critical change in our evaluation." A typical scan takes about seven seconds, and with several minutes for prepping and positioning the VetMouseTrap™ - with the pet inside - on the CT table, the procedure is done within 10 minutes, without stress to the patient or additional handling or restraint. "Instead of the cat being placed in an oxygen-supportive environment and given medications that may or may not be appropriate as we wait for the cat to become stable, which could take 24-96 hours, we're now doing CTs within the hour that the cat arrives," O'Brien said. "If we find that the problem's their heart, we can start heart meds right away - literally within an hour of the patient arriving at the hospital. The clients have been very happy that we've been able to get their pets' care started quicker and their pets home faster than we were able to do under previous circumstances." 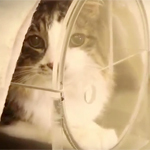 In a recent clinical trial, the researchers found that CT was equally effective as X-rays, biopsies and endoscopies at diagnosing upper airway obstructions such as masses, lesions and infections in awake cats. In a study of dogs that exhibited symptoms of abdominal obstructions such as vomiting and abdominal pain, the researchers found that CT was as accurate as X-ray and ultrasound at identifying primary features of disease, such as swallowed objects lodged in the dogs' intestines. However, CT was superior to the other modalities at detecting secondary features of disease, such as metastasized cancer, free air or fluid in the belly and tissue death in the intestines or stomach, conditions that determine not only if surgery should be performed but the type of procedure and the patient's prognosis. The quality of images obtained by CT is more consistent than images obtained by ultrasound, which can vary according to the skill and experience of the technician operating the equipment, O'Brien said. Although the VetMouseTrap™ was originally designed for small animals such as cats, rabbits and tiny dogs, O'Brien recently developed a larger version for use with medium-sized dogs such as Labradors and golden retrievers. And he is developing a model with a perch inside so birds can be immobilized and passed through the scanner. O'Brien and Lesley King, the director of the Intensive Care Unit in the College of Veterinary Medicine at the University of Pennsylvania, are beginning a collaborative research project in which they are using the larger VetMouseTrap™ to study whether CT is effective for diagnosing blood clots in dogs' lungs. "We've just never been able to CT this group of patients before because they have so much trouble breathing, and they're so dependent on their oxygen therapy," O'Brien said. Ports in each end of the VetMouseTrap™ accommodate oxygen lines and intravenous catheters so patients can remain on oxygen or IV therapy while undergoing scans, and clinicians need not disconnect and reconnect the lines when inserting or removing patients from the device. In a collaborative project with scholars in Pretoria, South Africa, O'Brien is investigating CT's efficacy as a comprehensive diagnostic tool for trauma patients, such as pets that have sustained multiple injuries after being struck by cars or attacked by other animals. "Instead of having to piecemeal the information - use one modality to look at their heads, take X-rays to look at their chests and perform ultrasound to look at their abdomens, which takes a lot of time and manhandling for all these different tests - we can do a tip of their nose to tip of their tail CT in about 15 seconds, even on a fairly large dog," O'Brien said. Several articles about O'Brien's research projects have appeared in the journal Veterinary Radiology and Ultrasound, most recently in the November/December 2012 issue.